IntLawGrrls: Will the Codification of the Crime of Aggression Benefit Women? Will the Codification of the Crime of Aggression Benefit Women? The Tapestry—the longest piece of embroidery on record—tells in detail how William the Conqueror contested the coronation of Harold upon the death of King Edward the Confessor. After arriving in England, William's troops pillaged the locals in preparation for battle. Among other atrocities that we would today designate as war crimes, they burned a home, sending this mother and her child fleeing. When elephants fight the grass gets hurt. how aspects of feminist theory might interpret the new regime. The Article concludes that any impact of the provisions will inevitably be limited by gaps and ambiguities in the definition of the crime and the jurisdictional regime, which is premised on state consent and exempts non-states parties altogether. At the same time, the insertion of the crime of aggression in the Rome Statute of the ICC enables the prosecution of a wider range of acts, and actors, that cause harm to women and makes actionable harm to women that may not rise to the level of war crimes or crimes against humanity and that has historically been rendered juridically invisible by the collateral damage euphemism. Extending the reach of international criminal law may generate indirect negative effects from the interaction of the Court’s potential to prosecute the crime of aggression and the long-standing jus in bello, that body of rules governing how war is waged rather than why war is waged, which is the purview of the jus ad bellum. By penalizing the resort to armed force, the threat of prosecution of the crime of aggression may undermine incentives to comply with key doctrines within international humanitarian law that serve to protect civilians and other vulnerable groups. 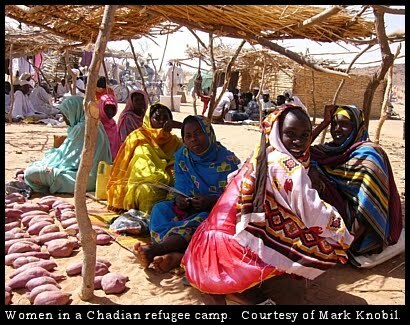 (Refugees in Chad at right, photo credit). It also remains to be seen whether the codification of the crime of aggression will serve any deterrent purpose whatsoever when governmental leaders contemplate using force—offensively or defensively—in their international relations, especially in situations that do not implicate exigent sovereign threats. To the extent that the new provisions do exert a restraining effect, the expansive way in which the crime has been defined may end up chilling those uses of force that are protective and thus more discretionary, such as uses of force employed pursuant to the nascent doctrine of responsibility to protect. The crime may thus result in more ex post prosecutions at the expense of ex ante efforts at preventing and repressing violence. Whether this over-deterrence argument should be raised on behalf of women, however, requires an acceptance of the legitimacy, if not lawfulness, of humanitarian intervention with or without Security Council approval and a coming to terms with a certain valorization of militarism and its inherent masculinities—a perspective that is alien to much feminist thinking. The International Criminal Court has yet to demonstrate that it can fulfill its current mandate. Operationalizing the crime of aggression without allocating additional resources to enable the Court to prosecute this controversial, largely unprecedented, and qualitatively different crime may distract the Court from responding more effectively to the “atrocity crimes” that now finally address gender-based violence more directly. The crime may also encourage the Court to focus on leaders in capital cities rather than the warlords next door, whom victims more directly associate with atrocities and without whose prosecution it may be impossible to achieve complete justice for women. Given the potential to reach top political leaders, the crime may be also subject to abuse. The amendments approved in Kampala will eventually permit states parties to refer each other to the ICC as alleged violators of the prohibition against aggression. Misuse of this referral authority could render the Court little more than just another forum for states to manipulate and exploit in order to advance their interests. Such an outcome would politicize and de-legitimate the Court.